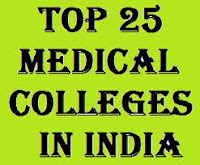 Top 25 Medical Colleges in India 2015 : 1. The only one person who can save a person's life other than God is a Doctor. Doctors are treated with utmost respect in the society and this is the reason why most of the people aspire to become doctor. Every year the number of students opting for medical stream are increasing rapidly. If you are a candidate who have completed your intermediate in Bipc and are looking for the top 25 medical colleges to continue rest of your studies, this article may be helpful to you. 2. Here you can find the list of top 25 medical colleges in India along with their location. 3. Once the candidate clears the entrance examination, based on the score obtained they choose any of the below college.